Let’s start by putting advertising in context. All advertising, including direct response radio, must be viewed in the appropriate context. Good advertising doesn’t exist for its own sake. Advertising has a purpose – and whether you call it “brand-building” or “direct response” or “relationship” or “transactional” or even “PR”– the root purpose of all commercial advertising is to grow a business by bringing new customers to purchase your product or services. We call that “customer acquisition.” So whether you’re Coca-Cola, Geico, McDonalds, Toyota, The Gap, Proactiv, or Home Depot, you advertise to grow sales. And sales only grow if you can sell more to more people for a higher dollar amount. Direct response radio can mean different things to different people. 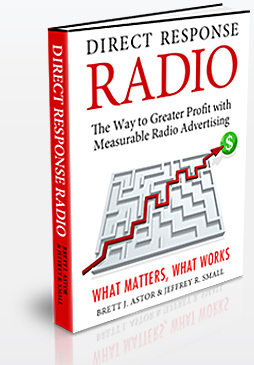 Before we were the authors of Direct Response Radio: The Way to Greater Profit with Measurable Radio Advertising, we began our radio advertising agency with the intent to bring about a very specific vision for what direct response radio can be. Our idea was to merge the worlds of direct mail and broadcast radio – leveraging the sophisticated database techniques and tracking tactics of direct mail with the reach, targetability and low cost of radio advertising. The result is a form of advertising that is measurable, efficient, cost-effective and scalable. Thus, a direct response radio advertising campaign is a scalable profit engine that helps you acquire new customers - profitably. Perhaps the key distinguishing characteristic of direct response radio is measurability. Because direct response radio advertising campaigns are built from the ground up with measurability in mind, every dollar spent can be tracked to revenues it generates. This measurability aspect means the campaign can be continuously refined by tactical changes that are informed by testing and analysis of results data. Ultimately, this means there’s no guesswork about whether a direct response radio campaign is contributing to profit. Because it’s measurable, you know it is.